, a Scotch antiquary, was the son of the rev. Pat. Anderson, of Edinburgh, where he was born Aug. 5, 1662. He had a liberal education at the university of that city, which was much improved by genius and application. When he had finished his studies, he was placed under the care of sir Hugh Paterson, of Bannockburn, an eminent writer to the signet, and made such progress, that in 1690 he was admitted a member of that society, and during his practice discovered so much knowledge joined with integrity, that he probably would have made a very distinguished figure had he remained longer in this branch of the law profession. The acquaintance with ancient writings, however, which he had been obliged to cultivate in the course of his practice, gratified a taste for general antiquities and antiquarian research, which he seems to have determined to pursue, and he happened to have an early opportunity to prove himself well qualified for the pursuit. 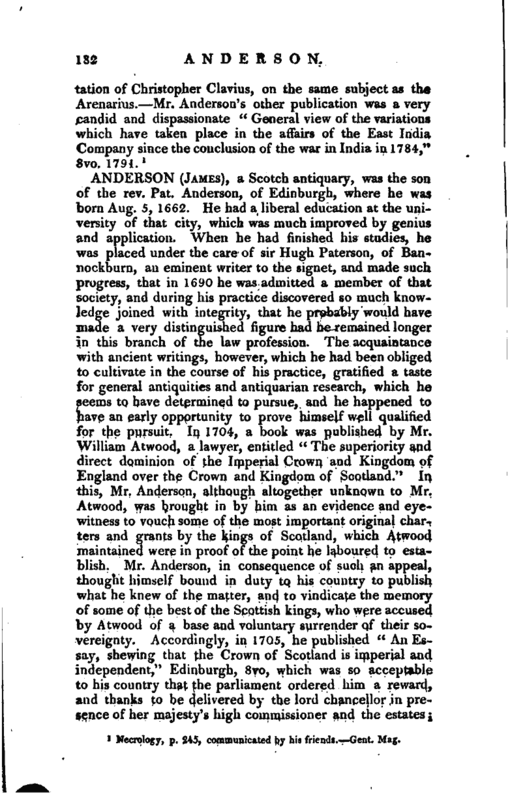 In 1704, a book was published by Mr. William Atwood, a lawyer, entitled “The superiority and direct dominion of tl?e Imperial Crown and Kingdom of England over the Crown and Kingdom, of Scotland.” In this, Mr. Anderson, although altogether unknown to Mr. Atwood, was brought in by him as an evidence and eyewitness to vouch some of the most important original chai% ters and grants by the kings of Scotland, which AtwoocJ maintained were in proof of the point he laboured to establish. Mr. Anderson, in consequence of such an appeal, thought himself bound in duty to his country to publish what he knew of the matter, and to vindicate the memory of some of the best of the Scottish kings, who were accused by Atwood of a base and voluntary surrender of their sovereignty. 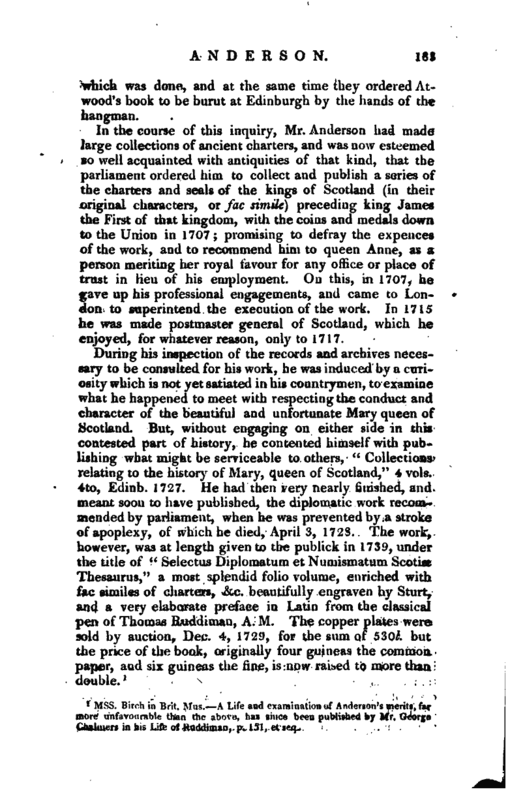 Accordingly, in 1705, he published “An Essay, shewing that the Crown of Scotland is imperial and independent,” Edinburgh, 8vo, which was so acceptable to his country that the parliament ordered him a reward, ind thanks to be delivered by the lord chancellor in presence of her majesty’s high commissioner and the estates, | which was done, and at the same time they ordered Atwood’s hook to he burnt at Edinburgh by the hands of the hangman. 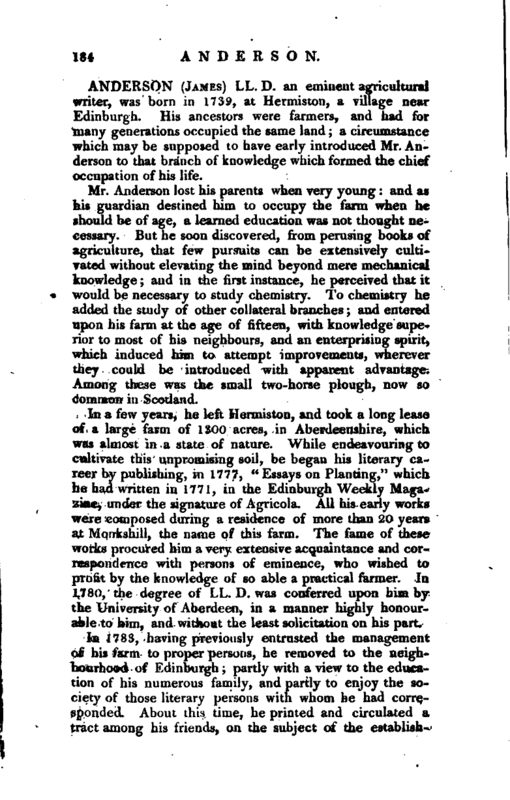 In the course of this inquiry, Mr. Anderson had made large collections of ancient charters, and was now esteemed so well acquainted with antiquities of that kind, that the parliament ordered him to collect and publish a series of the charters and seals of the kings of Scotland (in their original characters, or fac simile) preceding king James the first of that kingdom, with the coins and medals down to the Union in 1707; promising to defray the expences of the work, and to recommend him to queen Anne, as a person meriting her royal favour for any office or place of trust in lieu of his employment. On this, in 1707, he gave up his professional engagements, and came to London to superintend the execution of the work. In 1715 he was made postmaster general of Scotland, which he enjoyed, for whatever reason, only to 1717. Mss. Birch in Brit. Mus.—A Life and examination of Anderson’s merits, far more unfavourable than the above, has since been published by Mr. George Chalmers in his Life of Ruddiman, p. 151, et seq.